If you’re planning an outdoor adventure, a compass is one of the most important tools you need. The best compass will be able to easily help you figure out how to get from where you are to where you need to be. We researched some of the best-rated and top-selling products out there and put together these compass reviews for hiking, camping, or even boating. Before we jump in, let’s look at some of the top features you need to know. Waterproof:- If you’re an outdoorsy person who is willing to venture out no matter how much rain is forecast, you definitely need a waterproof compass. It’s also a good idea if you plan on using it near lakes, rivers, etc. Dimensions: Compasses come in a lot of different sizes but what matters is how you want to use it. Smaller ones are usually a little more basic without as many extras. Usually. There are many exceptions to that rule. Military Grade: We rated something military grade if it was the same quality that is used by the military. There are a lot of designs that mimic the military look but that’s definitely not the same thing. 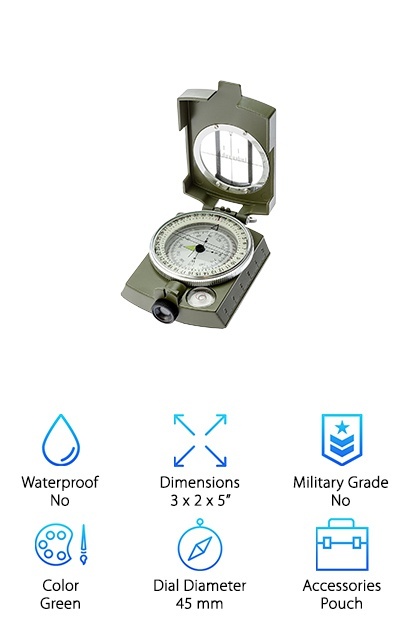 Color: A lot of the compasses we reviewed are styled after military versions and are Army green. But you’ll also find black, white, and even clear! Color is purely personal preference, though clear ones make map plotting very easy. Dial Diameter: This tells you how big the compass itself is. Larger ones will be easier to read and might even be easier to manipulate. Keep this in mind if you’re going to be wearing gloves while using it. Accessories: A lot of our top picks come with some pretty nice accessories. Some of these include lanyards, protective pouches, and even belt clips. All of the accessories are designed to make it easier for you to use the compass. Now that you know a little more about what features to look for in a compass, we can find our way into our reviews. Here’s how it works. We listed our top and budget picks first. That’s a great place to start if you’re running short on time. Then, keep reading to see what products rounded out our list. We were honestly surprised at the variety and we think you will be, too! All right, let’s get going. The Silva Ranger Compass is a solid, reliable performer made by a company that’s been selling compasses in the US since the 1940s. There are a lot of awesome features that make this the best backpacking compass. The lid has a mirror in it which is designed got split-sighting and helps make navigating to landmarks in the distance easier. Plus, it can double as an emergency signaling device if you get into trouble. To make plotting on a map easier, the edges of the baseplate are equipped with three different scales. That’s not all. For those times when you do use it on a map, there are silicone feet to keep it nice and steady. One of the best features is the geared declination. You can set it and forget about it. Our budget pick has a lot of practical features that make it a good choice for basic use. For starters, it has a thermoelastic liquid filled capsule with a floating dial as well as a glow in the dark arrow. What does that mean for you? It’s easy to read. The durable cover is made of die-cast zinc and designed with a cool camo print and it comes with a water-resistant nylon pouch for extra protection. The sides are lined with ruler markings in both inches and centimeters and there’s a conversion chart of the back to help you figure out angle, gradient, and distance. Plus, you can make use of the adjustable diopter sighting lens and the sighting lines on the cover to get where you need to go. 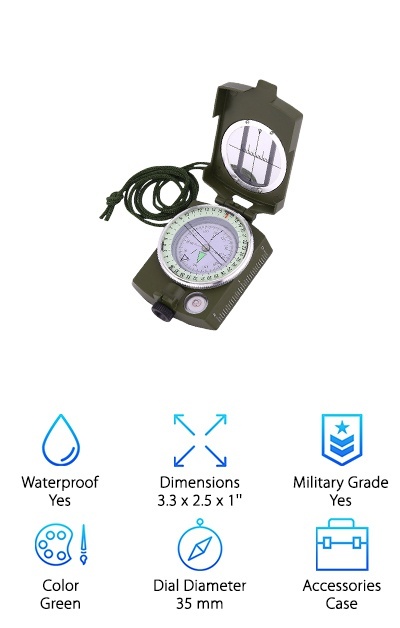 Because this model from Sportneer is military and professional grade, we’re calling it our best survival compass. Why? So many reasons! First of all, the ergonomic design makes it really easy to use. It’s waterproof, shakeproof, and durable. It comes with a belt loop attachment and case to protect it if you’d rather keep it in your pocket. That’s not all. There’s a lens on the rear sight that helps increase accuracy by magnifying the card dial. Not even nighttime will stop you from being able to navigate because the interface glows in the dark. Plus, it has a slope meter if you’re interested in using it for rock climbing or more intense hikes. One more thing, the sides of the compass have both an inch and centimeter scale. 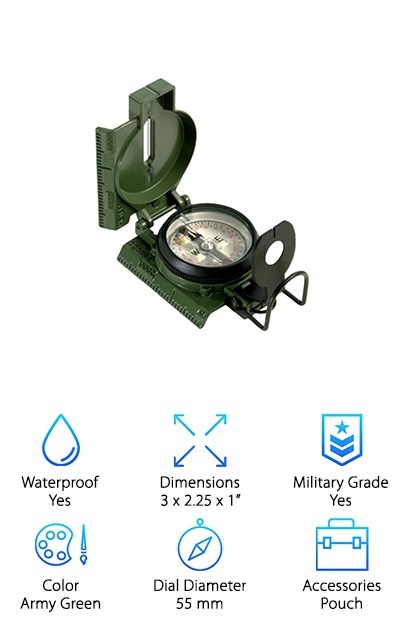 Here’s another choice for the best compass for survival. It’s professional grade and has a number of amazing features built right in. So, what all do you get? Well, for starters, it’s a great size, exceptionally lightweight. Plus, it has a heavy-duty construction thanks to the rugged metal case. You get a thumb hold and magnifying viewer, an adjustable luminous marching line, and a liquid filled luminous dial. Despite having all of these features, it’s still really easy to use. So easy, in fact, it’s a great one to learn on. It even comes with a necklace attachment so you can keep it close to you at all times. If you want to use it to help with plotting on maps, there’s an inch and centimeter scale. 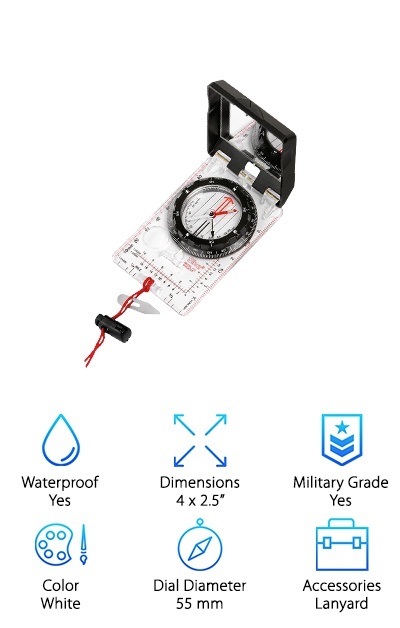 This is a reliable waterproof compass that would be great for camping, hiking, boating, or hunting. It’s really compact and lightweight so it’s easy to carry. Plus, the included lanyard and pouch make it easy to carry around with you. It constructed of high strength metal that can stand up to a lot of different weather conditions. There are a lot of practical features, too. Included are a built-in bubble level, rotating bezel ring, tripod screw hole, and an adjustable diopter sighting lens. There’s also a conversion chart on the back for angles, gradients, and distance. Plus, it’s easy to use with a map to figure out where you want to go thanks to the rulers on the edges in both centimeters and inches and you get a handy user guide. 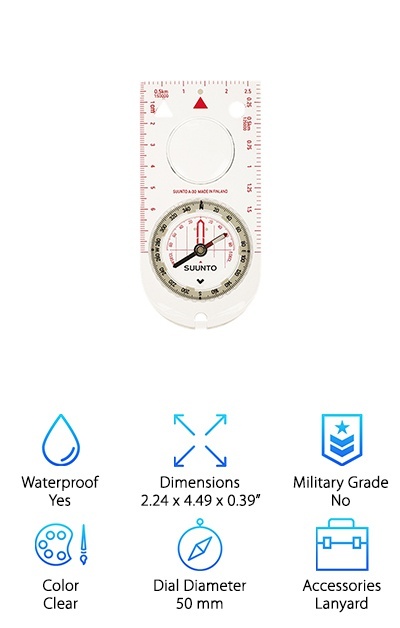 One of the best features of the Suunto A-30L Field Compass is how well it operates in low light. It has glow in the dark markings and the clear base includes a magnifying lens. Yes, the body is clear and made of tough, scratch resistant acrylic. It’s the perfect hand-held size and even comes with a lanyard that has an easy release snap lock. The base also has a centimeter scale for map plotting. Another cool thing is the fixed declination scale that can be set to your current location that will save you some time when navigating. The fluid-filled capsule gives you a more accurate reading. One last thing, the bezel has a textured ring that makes it easy to use, even with gloves. If you’re looking for the best compass that looks like an antique, you have to check out the SharpSurvval Camping Compass. It doesn’t just look cool. You get a lot of cool features with this one, too. The 360-degree rotating bezel helps make it a little bit easier to navigate. Worried about getting stuck in the dark? 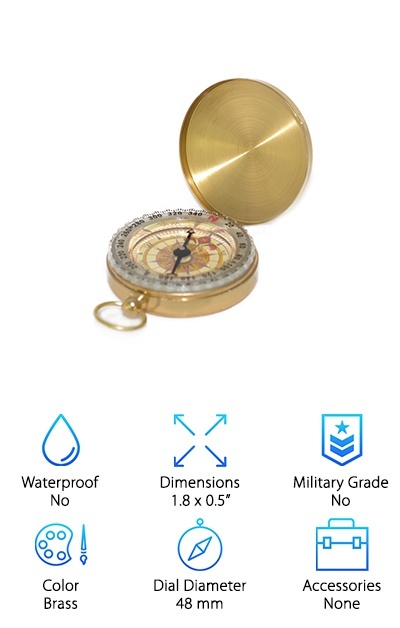 This compass has a glow in the dark dial that makes it easy to read whether it’s night time or inclement weather. It’s a great size, too, perfect to hold in your hand or slip in your pocket. This is a great basic compass that would be a great choice for someone just learning how to use one. It’s also a good choice for an older child who’s interested in navigating the outdoors. Another great choice that would make the best compass for hiking is this Rothco 3H. 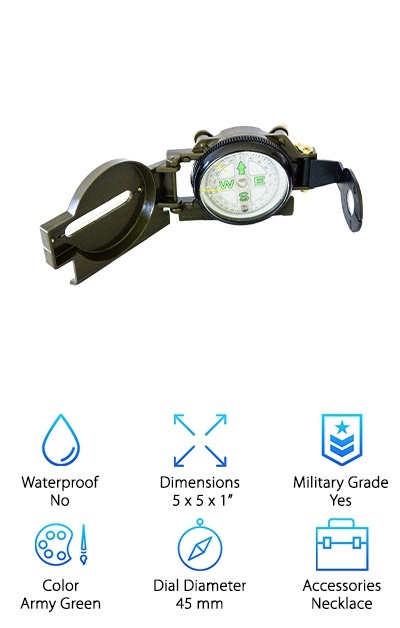 Military Lensatic Compass which is built to the specs of the U.S. Military. Its aluminum frame was made to be rugged and stands up to a lot of abuse, including shock, water, and sand. And get this: it even works in temperatures from -50 to 150 degrees F. If you need to navigate in low-light, this best hiking compass is a great choice. Why? It actually has 7 tritium micro lights. There are a lot of other great features, too, including a magnifying lens, sighting wire, and a copper dampening system that keeps magnet rotation slow and even without any liquids. It also comes with a carrying pouch and a belt clip. 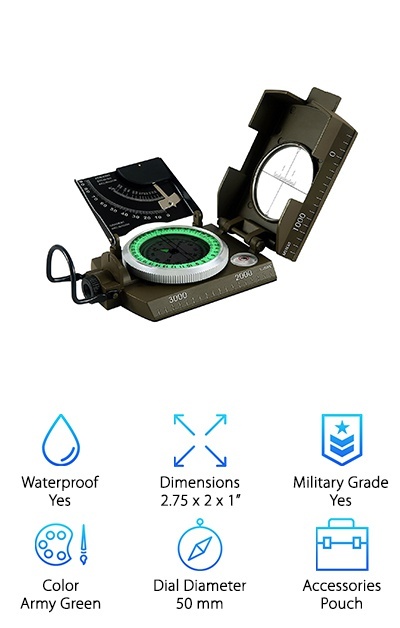 If you’re in the market for an affordable and accurate compass that’s a great learning tool, look no further than the Under Control Sighting Compass. 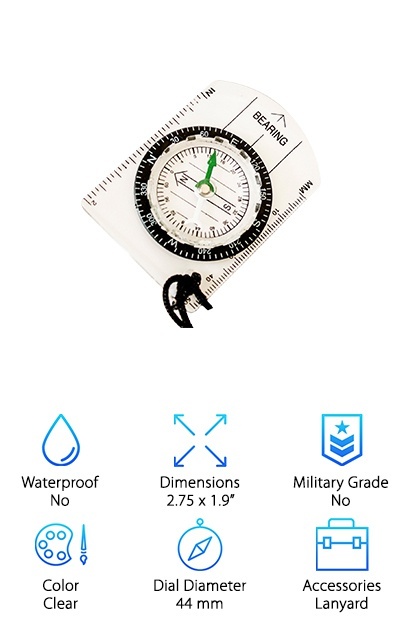 Because it has a clear base plate, it’s ideal for learning map navigation making it an ideal choice for scouts, nature classes, or just a nice tool for your kids to use to begin learning navigation. Plus, it has ruler marking in both inches and millimeters so no matter where you need to go, you can figure out how to get there on the map. It’s designed to be perfect for carrying and, well, we can definitely say that they succeeded. It’s small and exceptionally lightweight. Believe it or not, it actually weighs less the 1 ounce. This model includes a lanyard and a 360-degree turntable. We couldn’t make a best of list without including the best compass watch, so here you go! 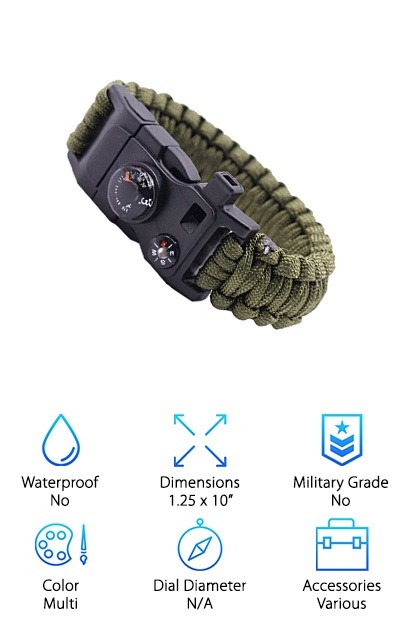 If you’re looking for something that has just what you need to survive outdoors, the features included in this watch will blow your mind. What do we mean? If you can believe it, here’s what you get in addition to the compass: a thermometer, flint fire starter, emergency whistle, and fire scraper. That’s not to mention the multi-tool that functions as a hexagon wrench, screwdriver, saw tooth, bottle opener, nail file, and knife plus the band also functions as a parachute rope. We told you, this thing has everything. And get this: the parachute rope can hold up to 500 pounds. Plus, the compass is set into the top of the buckle so it’s secure and easy to read.